This business card, which is in somewhat sad condition, was tucked away inside an old book. 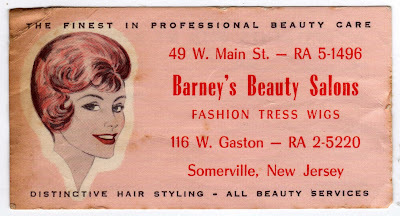 It's for Barney's Beauty Salons, which had two locations in Somerville, N.J. The 116 W. Gaston location is now the home of Bangz Hair & Nail Studio. So the building -- or at least that site -- has possibly remained a beauty salon through the decades. Meanwhile, the 49 West Main Street location now appears to be the site of a comic book store called A Comic Adventure. 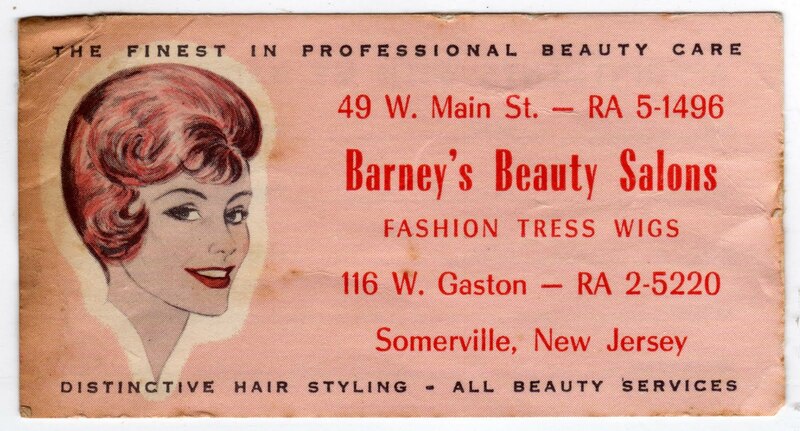 The "Fashion Tress wigs" mentioned on the business card were a popular brand in the 1960s and early 1970s. They were marketed for the "woman on the go" and made in Europe from "luxurious, all-human hair." Here's an advertisement for Fashion Tress wigs from an April 1965 issue of Ebony magazine. Fashion Tress was a predecessor of Claire's.